CJ david Maraga has just addressed a press conference today 19/09/2017 3.30pm at the judicial service commission premises. He noted that the recent attacks on judges aims to intimidate judges and will not seek direction on how to execute their mandate. This is after petitions filed aiming supreme court judges who nullified presidential elections. 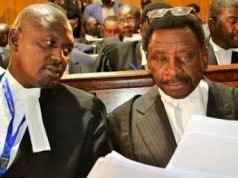 However what shocked many is after revealing that the inspector General of police Joseph boinnet has failed to act to protect the Supreme court judges exposing them to danger. Maraga says that the judiciary enjoys security just like the executive. He noted that if anything happens to individual judges and their families, those attacking them verbally will be held responsible. PHOTOS OF MORE THAN 63 KDF SOLDIERS KILLED IN SOMALIA BY ALSHABAB.